Copycat KFC Coleslaw, everyone’s favorite fast food side dish made at home! This recipe is quicker than running through the drive-thru! 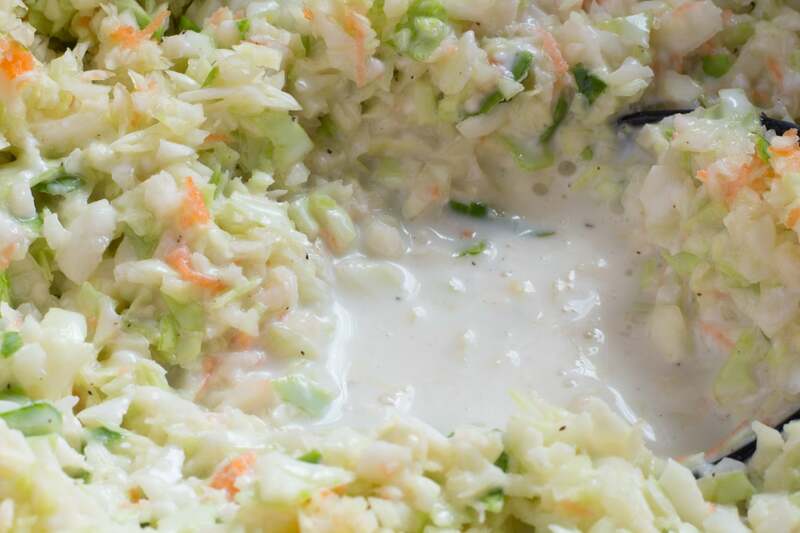 Not many people can resist this popular side dish of diced cabbage, carrots, and onions mixed with just the right amount of dressing. It’s a little sweet with a perfect balance of tanginess in the background. 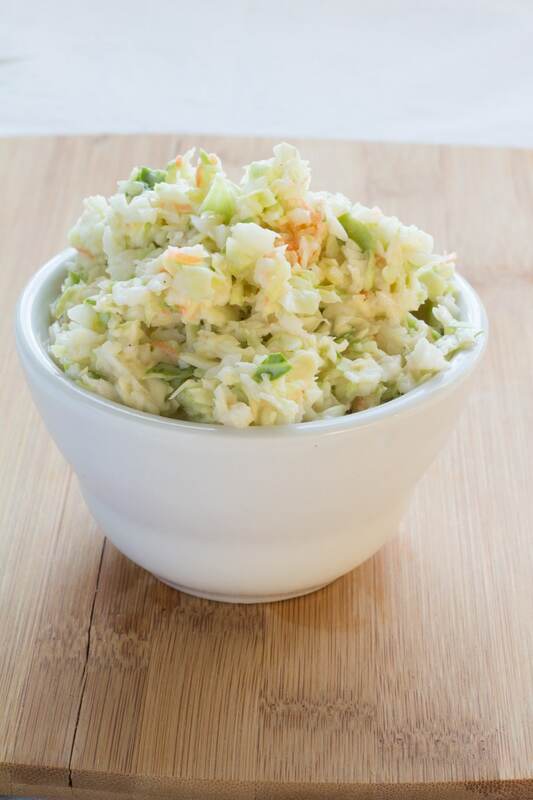 In less than 10 minutes you can have some of the best coleslaw waiting in the refrigerator for your next meal! Green cabbage is used in this recipe and by KFC. Using red cabbage in this recipe may cause some discoloration in the finished product. The dressing will turn a shade of pink. I generally need around 1/2 to 3/4 of a large head of cabbage. If the head of cabbage is on the small side it may take the whole thing. I start with half of a head first. If I need more then I go on and run a bit more through the food processor. The cabbage isn’t really useful for other recipes once it has been so finely diced. Remove any loose leaves and discard. Those leaves are great for stuffed cabbage, but they are really too limp for coleslaw. 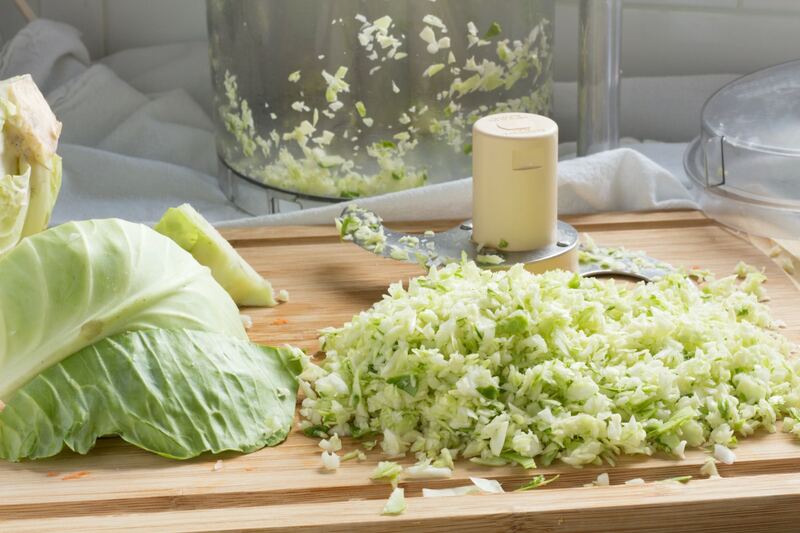 To be on the super safe side you can rinse the cabbage well after chopping into large pieces but before processing. When doing this, make sure that the cabbage is completely dry before using it. The cabbage is chopped into pieces about the size of grains of rice. Pieces this size will produce the same texture as the coleslaw from KFC. I use the food processor for this. 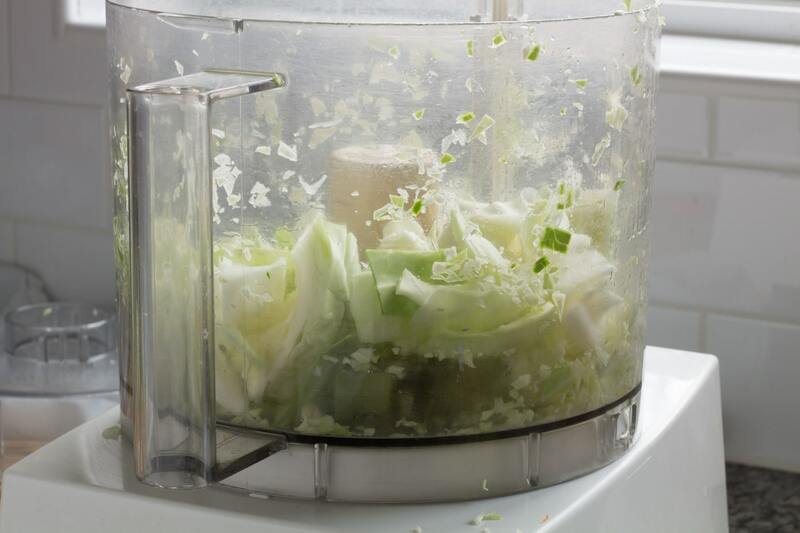 Cut the cabbage into large chunks before adding the cabbage to the food processor bowl. Only add 1 1/2 to 2 cups of cabbage chunks at a time. 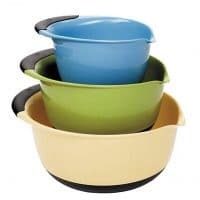 Using any more than this just won’t chop evenly. Pulse the cabbage for 1 to seconds and allow 1 to 2 seconds in between pulses. If there are any large pieces of cabbage sticking to the sides of the bowl, open the food processor and scrape those down. The second the cabbage pieces look like pieces of rice, STOP pulsing. If the texture is not important, shredded cabbage or a bag of coleslaw mix can be substituted for the chopped cabbage. 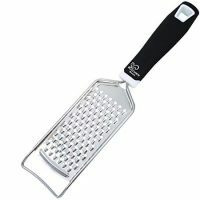 Finely shredding then dicing the shreds is another option for the perfect sized pieces. I prefer regular carrots for this recipe. They are more economical and easier to work with than baby carrots. 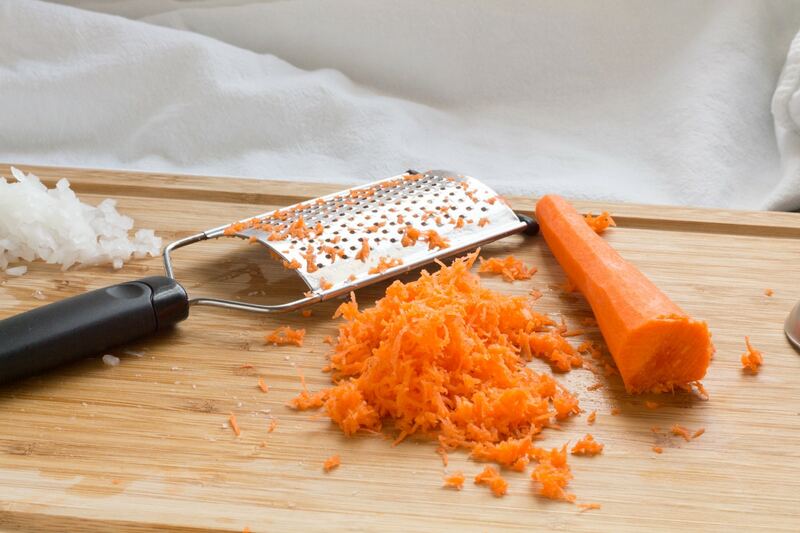 I grate my carrots using the small holes on a food grater. It adds tons of color without adding hard crunchy pieces to the coleslaw. Carrots can be finely diced using a kitchen knife. 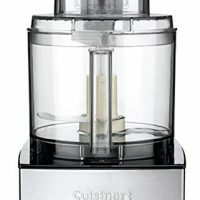 A food processor can be used. The problem with using this method is there are not enough carrots needed to be able to get a uniform dice. Larger pieces don’t really fit in with the texture profile. Onions need to be finely diced. Grated onions are the best if you can stand the tears when the onion fumes hit your eyes. 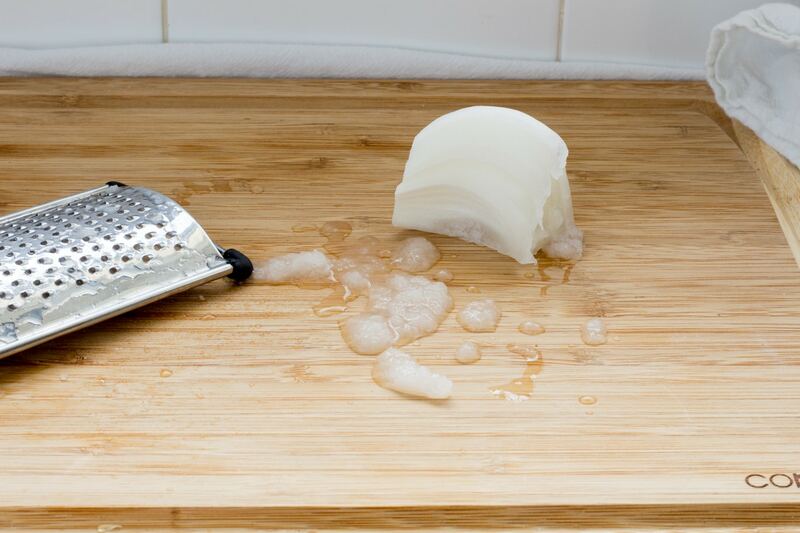 For diced onions, use 2 tablespoons. I usually have fresh lemons so I use fresh juice. KFC Coleslaw has enough other flavors in it that substituting with concentrated lemon juice would be fine. Using extra vinegar would also work in a pinch. Vinegar will not add the same brightness lemon juice does and vinegar will slightly affect the finished product. It will still be a darn close copycat recipe, but if you taste it and think it’s missing something this might be the problem. This recipe does use buttermilk. I recommend buying some. I have tried this with regular milk and while it tastes fine, it just isn’t as close to KFC’s. KFC Coleslaw has a certain tang that is only achieved by using a balance of different acids. Make sure mayonnaise is used, not a salad dressing like Miracle Whip. Salad Dressing will make this coleslaw way too sweet. Once the dressing has been added to the coleslaw it may seem that there is not enough dressing. Do not be fooled by this! 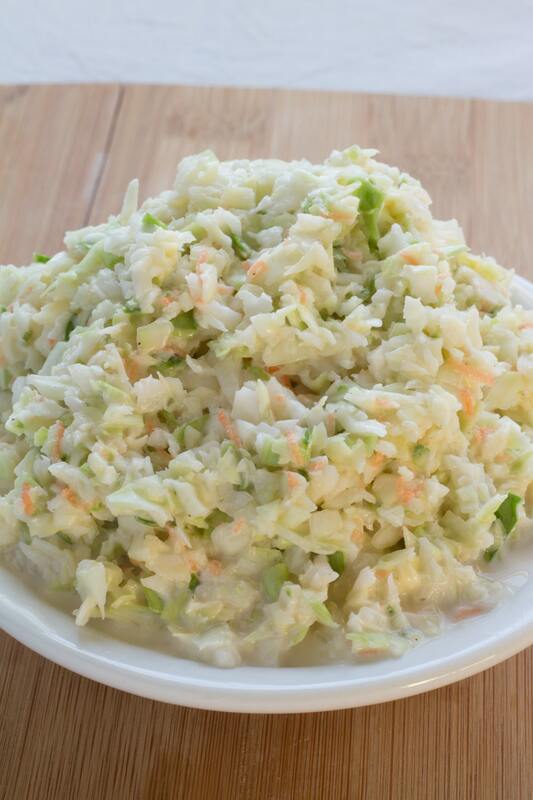 As this coleslaw sits for a few minutes it will start to produce more liquid. It may even seem a bit watery. That’s what coleslaw does. The cabbage gives off liquid as it starts to wilt. See all the dressing in the bottom of the bowl after sitting for just a few minutes? Stir the coleslaw occasionally to redistribute the dressing. Give it one last stir before serving. A thicker dressing can be made by adding 1/4 to 1/2 teaspoons of xanthan gum. If using xanthan gum it must be mixed with wet ingredients while using a blender or food processor to avoid major goo from forming. Unless you do a lot of gluten-free baking or eat strictly vegan you aren’t likely to have any of this. It’s pricey and I would not rush right out to by a lifetime supply, usually a single bag, just for this one recipe. SHOULD I MAKE KFC COLESLAW IN ADVANCE? 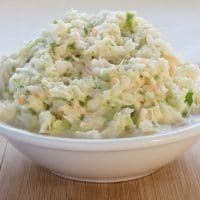 This coleslaw can be eaten as soon as it has been made. The flavor improves when allowed to sit for at least 4 hours. I try to make this as early in the day as possible. The longer it sits the better it gets. We actually prefer to flavor after it has been allowed to sit in the refrigerator for one day. HOW TO STORE KFC COLESLAW? 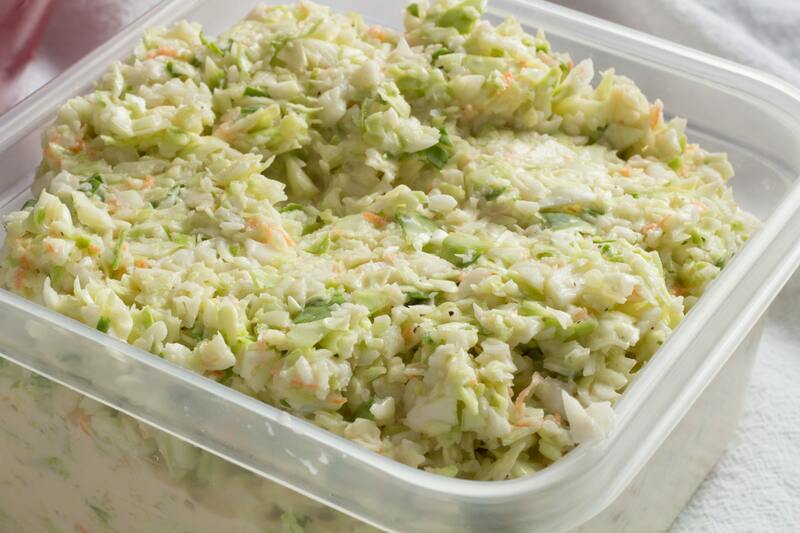 This coleslaw will last 2 to 3 days when refrigerated in an airtight container. After that, it will begin to go limp and will not be very appetizing. To keep this for longer than a few days, store the vegetables and dressing individually and mix them together 4 hours or so before serving. 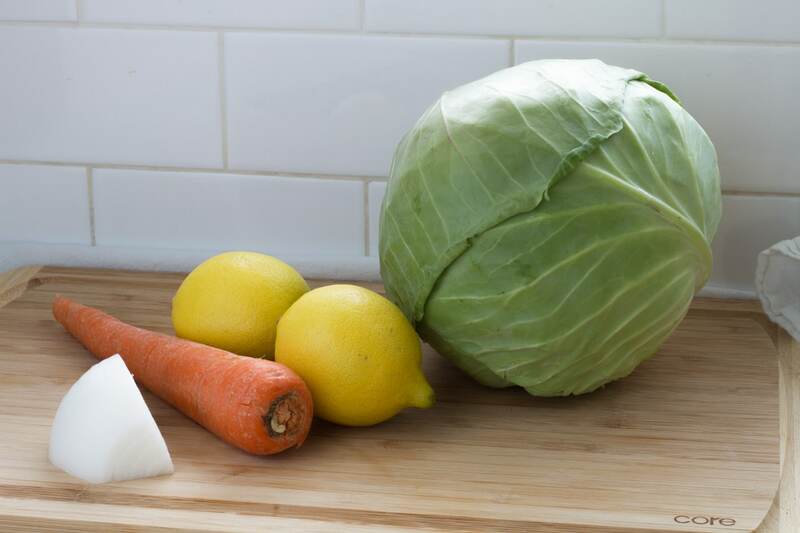 Remove as much air as possible from the bag of diced cabbage to prevent browning. Stored properly, the diced, undressed cabbage will last about 2 days before it starts to turn brown. Do not freeze this coleslaw. Cabbage only freezes well after it has been blanched and mayonnaise separates when it has been frozen. This recipe is so quick and easy we recommend just making a fresh batch. Pulled Pork or Chicken, you can even use coleslaw as a topping for pulled meat sandwiches and sliders! Place cabbage, carrots, and onions in a large bowl and stir to combine. Some of the shredded carrots may clump together. They will finish separating when mixing with the dressing. 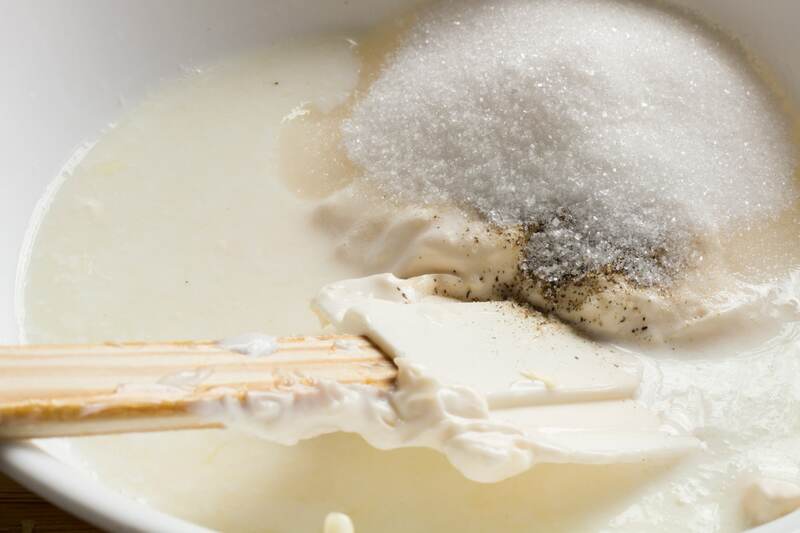 In a separate bowl, combine remaining ingredients and stir until smooth and creamy. Pour dressing over the cabbage and mix until all of the cabbage has been coated with dressing. 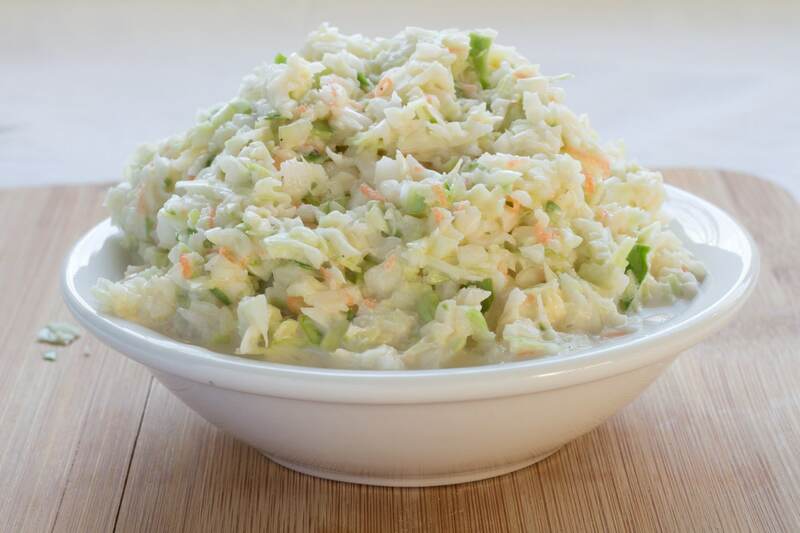 Place coleslaw into a covered dish and place into the refrigerator. The coleslaw can be eaten immediately, however the flavor is greatly improved with at least 4 hours of refrigeration. Do not use salad dressing, like Miracle Whip, the coleslaw will be too sweet. Increase carrots to ¼ cup if using finely diced carrots. 1 medium head of cabbage or 1/2 of large head of cabbage will make 8 cups of diced cabbage. Thinly sliced cabbage or coleslaw can be substituted for finely diced cabbage. The texture will not be the same as KFC. Increase onions to 2 tablespoons if using finely diced onions. Thanks for checking in! Let me know your thoughts on the recipe when you try it! Beth, I just love KFC coleslaw and have never been able to get it right at home. Your recipe looks perfect and the finished product looks so spot on that I can’t even tell it’s not from KFC. Your tips and techniques are so helpful. Can’t wait to try it this week with our fried chicken dinner!